Sweet Honey in the Rock is an all-woman, African-American a cappella ensemble. 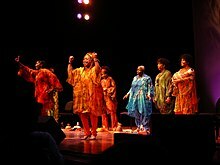 They are an American three-time Grammy Award–nominated troupe who express their history as African-American women through song, dance, and sign language. Originally a four-person ensemble, the group have expanded to five-part harmonies, with a sixth member acting as a sign-language interpreter. Although the members have changed over four decades, the group continues to sing and perform worldwide. Flying Fish, Rounder Records, Sony Records, Redwood, Music for Little People, Earth Beat!, Rykodisc, Appleseed, Freedomsong Productions (Australia only), SHE ROCKS! Sweet Honey in the Rock was founded in 1973 by Bernice Johnson Reagon, who was teaching a vocal workshop with the Washington, D.C. Black Repertory Company. Reagon retired from the group in 2004. The name of the group was derived from a song, based on Psalm 81:16, which tells of a land so rich that when rocks were cracked open, honey flowed from them. Johnson has said that this first song in which four women blended their voices was so powerful, that there was no question what the name of the group should be. The ensemble's most powerful messages are proclaimed through an enormous catalog of songs addressing the world's woes. They are currently occupied with immigration injustices, congressional greed and lack of compassion for citizens, the environmental imbalance, racial issues and women's issues. Sweet Honey in the Rock has received several Grammy Award nominations, including one for their children's album, Still the Same Me which received the Silver Award from the National Association of Parenting Publications. They won a Grammy Award for Best Traditional Folk Album for their version of Lead Belly's "Grey Goose" from the compilation album Folkways: A Vision Shared. Their vocals appeared in a number of animated counting cartoons on the long-running PBS series Sesame Street, and the group was the subject of the 2005 documentary Sweet Honey in the Rock: Raise Your Voice. Over the decades, more than 20 individuals have lent their voices to Sweet Honey in the Rock. Beginning as a quartet, the group is now composed of six African-American women (including a professional American Sign Language interpreter who accompanies the group on concert tours). Sweet Honey in the Rock in Concert, 2006. On June 22, 2010, the group released the song "Are We a Nation? ", their response to Arizona's controversial immigration law, SB-1070. An official music video of the song was released online on July 2, 2010. Directed by James Lester, the video was shot in New York City at Tainted Blue Recording Studio during a live recording session of the song. Amanda Navarro researched and provided the video's archival images and Russel Soder was the cinematographer. Ramon Hervey II served as the project's executive producer. The band donated a portion of the proceeds from the sales of "Are We a Nation?" to the Center for Community Change, an organization founded in 1968 to honor the life of Robert F. Kennedy. Sweet Honey in the Rock also joined The Sound Strike, boycotting performances within Arizona in protest of the law. ^ a b Post, Laura (2011). "Sweet Honey in the Rock/Biography". Allmusic biography. Rovi Corporation. Retrieved 20 December 2011. ^ Cary, Emily (December 1, 2011). "Sweet Honey in the Rock spreads holiday cheer". The Washington Examiner. Retrieved 26 December 2011. ^ Catlin, Roger (May 13, 2016). "Sweet Honey in the Rock has been making music, and taking a stand, for 43 years". The Washington Post. Retrieved 3 October 2017. ^ "Sweet Honey in the Rock 40th Anniversary… Forty & Fierce"
Wikimedia Commons has media related to Sweet Honey in the Rock.